The U7 through U12 Academy Program is an alternative to the traditional recreational and select (traveling) team programs and offers the opportunity for advanced development of the young soccer player. This program is a league for boys and girls ages 6-12 years old. The focus of this league will be participation and development in a fun and rewarding environment, within a competitive arena, while emphasizing proper skills acquisition and training techniques. The Academy follows a training curriculum that is fun while allowing for optimum player development. 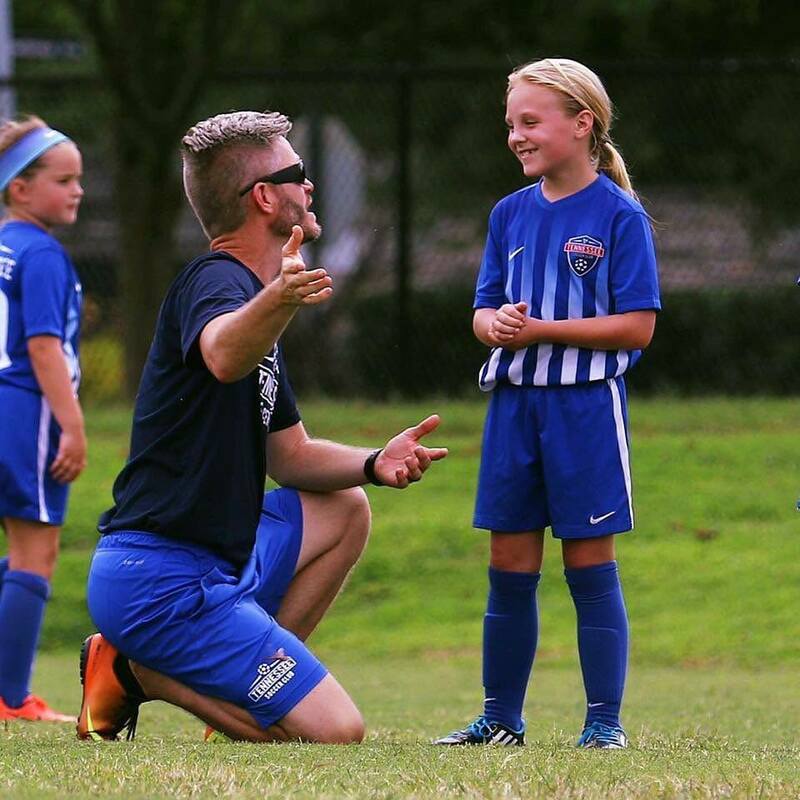 The goal of this program is youth player development that follows guidelines and recommendations put forth by the Tennessee State Soccer Association (TSSA) and the United States Soccer Federation. All teams are trained by appropriately licensed, professional Club coaches to provide the players with the best possible foundation of skills and knowledge of the game. The players will be selected through an evaluation process then placed in a pool of players for practice, when the age group has large numbers, there may be two to four pools of players for practice, with players of similar abilities in each pool. Throughout the season, games will be played against other Tennessee Soccer Club Academy teams and against other local clubs’ Academy teams. Players within the teams may be rotated and exchanged from team to team throughout the season. Team training occurs twice weekly with games on weekends. Additional training opportunities along with speed, strength and agility training will be available and encouraged. The Academy teams will participate in 2-3 tournaments per season. Academy soccer emphasizes maximum development of individual skills and provides the opportunity to apply those skills in a competitive environment, including intramurals, friendly play and tournament competition. Young players with commitment, skills and attitude will find Academy Soccer to be a good introduction to D1, D2 and D3 play. Acceptance to the Tennessee Soccer Club program is based on player evaluations, which take place during tryouts each spring. Tennessee Soccer Club expects players who represent the club to maintain high standards of personal behavior both on and off the field. We place great importance on academics and expect players to organize their activities to accommodate both schoolwork and soccer at high levels of achievement. We look to parents to ensure that their Tennessee Soccer Club players reach games and practices on time, attend whenever possible with a positive attitude, and participate in the running of the Club in some capacity. Tennessee Soccer Club will also offer an Under 6 (U6) training program. These players will also be assessed at the tryout session and invited to participate in a fun and developmental training environment. This program will be run by TSC professional staff, providing a great learning environment while allowing the U6 player to remain on his or her recreation team. Competitive soccer teams play for two seasons, fall and spring, which make up one seasonal year. For Academy players, this comprises the fall and the spring season. Additional opportunities for indoor play are available in the Winter months, and players are encouraged to take advantage of those opportunities. Academy (U7 - U12) pool system allows for a flexible practice environment, and the opportunity for coaches to evaluate players in various practice environments, and a flexibility in roster selection which allows for better learning opportunities on a week to week basis. The pool system also allows for roster adjustments to made ensuring that the appropriate level of competition is acheived. Because practices are where much of the learning and development take place, participants must attend both practices/week. Occasionally, conflicts arise in which the participant cannot attend a practice. Other activities (music lessons, other sports, homework, vacations, etc.) should be considered before committing to competitive programs to avoid significant interruption of the required practice and game schedule. By accepting a place on an Academy roster, a player commits to play the full seasonal year, June through May. For Academy players, this comprises the fall and the spring season. Evaluations for Academy teams are held according to the Tennessee State Soccer Association calendar, usually in late May, each year for the coming soccer seasonal year. Recreational players can join Tennessee Soccer Club at any time during the year. As long as you are not registered with another Academy club you are free to tryout for Tennessee Soccer Club. Players registered with another travel club through TSSA must obtain a release from their current club before any discussions about playing opportunities can be held. During the tryout period, you will be asked for information as to age and past experience in order to place your child in the correct age group for evaluation, this may be done during the online registration process also. At tryouts your child will be evaluated by the coaching staff in various group activities. The staff will assess current skill level, desire and potential ability. This criterion is evaluated along with consideration as to how and where that individual’s ability will best fit in order to foster continued learning, improvement and further a competitively challenged environment. Once this is determined over the course of the tryouts, your child may be offered a position with the Academy. You will have 14 days to consider that position with the club and make the appropriate steps for acceptance. Academy (U9 - U12) teams may participate in some local select tournaments (2-3 per season) and on occasion may require extended travel outside of the immediate area. Tournaments are not included in the registration fee. Teams must register according to the procedures published by the hosting clubs and on the dates specified.